I woke up well rested this morning, a rather rare occurrence lately. I’m having this problem where I’m in such a lovely mood that I am trying to stay awake long enough to not miss it. Thing is, I need sleep, and I got a good lot of it last night, which meant I was pretty much immediately ready to hop out of bed and take a nice bike ride around town. I headed over to Druid Hill Park where the neighborhood was doing laps–walking, jogging, high-stepping, and bicycling. It was a bit crowded, so I took the left off the reservoir path and onto the Jones Falls Trail, under tree canopies and around the arboretum, dodging zoo traffic and disc golfers, and then I was headed down the hill to Woodberry. I snapped this picture at one of the switchbacks on this prettiest part of the trail. It was all green and blue skies and a rare whisper of a cloud, and it felt so good, so at home, to be rolling down to another neighborhood for brunch. I ended up eschewing the newer, fancier choice for an old favorite, but that meant a ride along Clipper Mill Road in all its lushness for a short climb back to Hampden. And then I took the bike back toward Waverly for a stop in a garden to peek in on a beehive before spinning home. It was a perfect sunny Saturday morning, made inestimably better by traveling by bike. 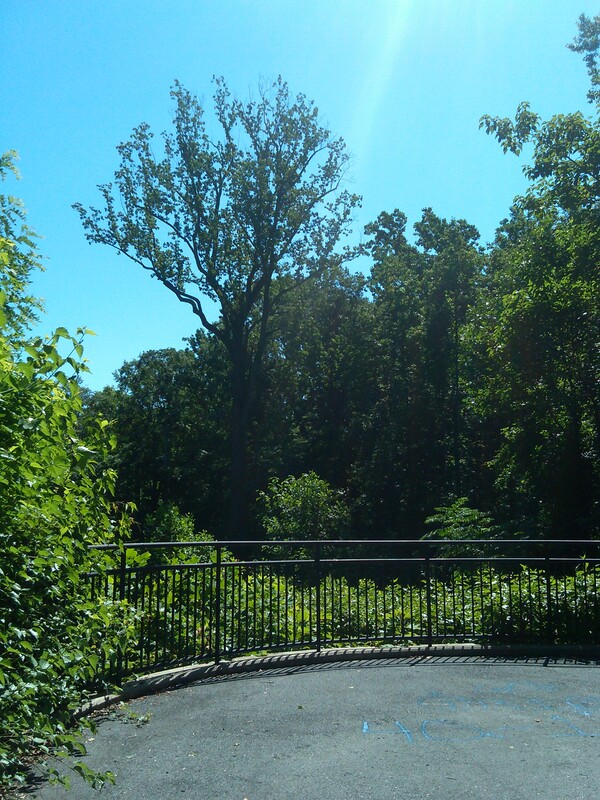 This entry was posted in bikes, nature, parks and tagged Druid Hill Park, Jones Falls Trail, Waverly, Woodberry. Bookmark the permalink.